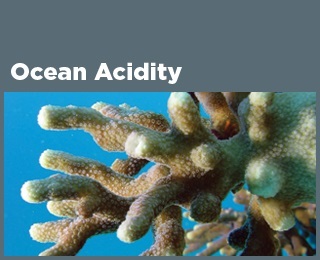 ﻿ Fun Easy English - Environment - Global warming - Climate change Indicators: Ocean Acidity. 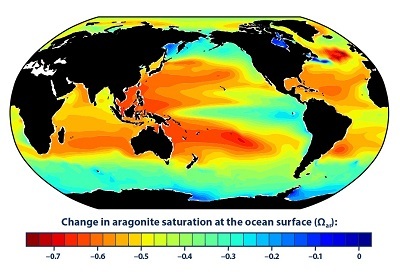 The largest decreases in aragonite saturation have occurred in tropical waters (see Figure 2); however, decreases in cold areas may be of greater concern because colder waters typically have lower aragonite saturation levels to begin with. The ocean plays an important role in regulating the amount of carbon dioxide in the atmosphere. 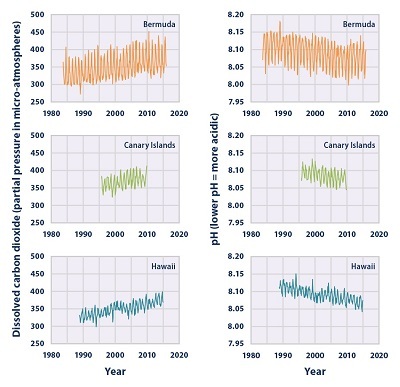 As atmospheric concentrations of carbon dioxide rise (see the Atmospheric Concentrations of Greenhouse Gases indicator), the ocean absorbs more carbon dioxide. Because of the slow mixing time between surface waters and deeper waters, it can take hundreds to thousands of years to establish this balance. Over the past 250 years, oceans have absorbed about 28 percent of the carbon dioxide produced by human activities that burn fossil fuels. Although the ocean’s ability to take up carbon dioxide prevents atmospheric levels from climbing even higher, rising levels of carbon dioxide dissolved in the ocean can have a negative effect on some marine life. Carbon dioxide reacts with sea water to produce carbonic acid. 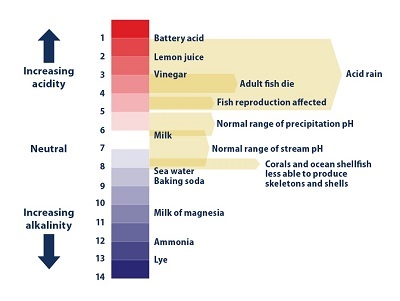 The resulting increase in acidity (measured by lower pH values) changes the balance of minerals in the water. This makes it more difficult for corals, some types of plankton, and other creatures to produce a mineral called calcium carbonate, which is the main ingredient in their hard skeletons or shells. Thus, declining pH can make it more difficult for these animals to thrive. This can lead to broader changes in the overall structure of ocean and coastal ecosystems, and can ultimately affect fish populations and the people who depend on them. Signs of damage are already starting to appear in certain areas. This indicator focuses on surface waters, which can absorb carbon dioxide from the atmosphere within a few months. It can take much longer for changes in pH and mineral saturation to spread to deeper waters, so the full effect of increased atmospheric carbon dioxide concentrations on ocean acidity may not be seen for many decades, if not centuries. Studies suggest that the impacts of ocean acidification may be greater at depth, because the aragonite saturation level is naturally lower in deeper waters.